The original sequel to Super Mario Bros. was released exclusively in Japan on the Famicom Disk System in 1986. The game's extremely high difficulty level and its late consideration for the US market meant that a different Super Mario Bros. 2 was released in its place. The Lost Levels features almost exactly the same gameplay mechanics, level structure and graphics as Super Mario Bros., and was even given an identical story. As in the first game, the goal is to clear each stage by reaching the flagpole. The difficulty of the stages has dramatically increased, and this game is widely considered to be one of the most difficult games in the Super Mario Bros. series. Gameplay Differences to Super Mario Bros. In Super Mario Bros., Mario and Luigi were identical characters for Player I and Player II respectively. The Lost Levels is a 1-Player game, and you choose whether you want to play as Mario or Luigi from the title screen. Luigi can jump higher than Mario, but he has very little traction, meaning he will slide much farther when changing direction or landing after a jump. A new item that appears from ? Blocks. The Poison Mushroom looks very similar to a Super Mushroom, but it damages Mario in the same way as touching an enemy. Warp Zones appeared in Super Mario Bros. as a way of skipping stages in the game to reach later worlds. In The Lost Levels, several Warp Zones will send you back to an earlier level (3-1 to 1-1 and 8-1 to 5-1). Green Jump Boards appear that make Mario or Luigi jump completely off the screen and not fall for a few seconds. They are mainly used to clear large pits. From World 5-1, strong winds start blowing, pushing Mario or Luigi backwards and making it difficult to jump across gaps. There are no totally new enemies in the game, but several returning enemies reappear in different forms. The Red Piranha Plant will appear out of pipes even if you are stood next to or on top of them, while Upside-Down Piranha Plants appear from World 5-1. Sky Blooper acts the same as a regular Blooper but it appears in the sky (and can be defeated by jumping on it). There is also a Fake Bowser who appears in the later stages, blocking your way to the real Bowser. A technique that has been used in every Mario game since, jumping on an enemy and then hitting the Jump button just as you land on top of it will give Mario or Luigi extra jumping height, allowing them to clear large pits. A number of stages can't be cleared without mastering this technique. A new Continue feature allows you to begin from the first stage in that World, even if you get a Game Over. 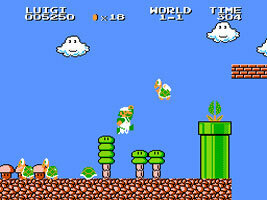 While invisible blocks appeared in Super Mario Bros., they contained Coins or 1-Up Mushrooms. In The Lost Levels, you can also collect Power-Ups from invisible blocks (including Poison Mushrooms). As in Super Mario Bros., you beat the game if you clear 8 Worlds. However, The Lost Levels features five hidden worlds that only appear by meeting certain conditions. Clear World 8-4 without using the Warp Zone (including Reverse-Warp Zones). When you begin World 9-1 your lives are reduced to 1. After clearing World 9-4, you start again back at World 9-1. On stage 9-4, the word "Arigato" (Thank You) is written in blocks - a message from the designers. Each time you beat World 8-4, a Star appears on the title screen. After beating the game 8 times (8 Stars), you will go on to World A-1. Clear the four stages in each world to move on to the next.